You may know that I have a small, let's call it, "thing" for bloody marys. But you may not know that I also go wild and crazy for a huge cup of tasty FroYo. It all began with the Pinkberry on West 32nd Street. Then weekly trips to the Red Mango in FiDi. Then a small, now abandoned, shop called 21 Flavors in Pasadena. But it wasn't until the 2nd Avenue Yogurtland in Long Beach, CA that I found my FroYo home. With everything from plain tart to birthday cupcake batter, Yogurtland has any and all the delicious flavors I crave. 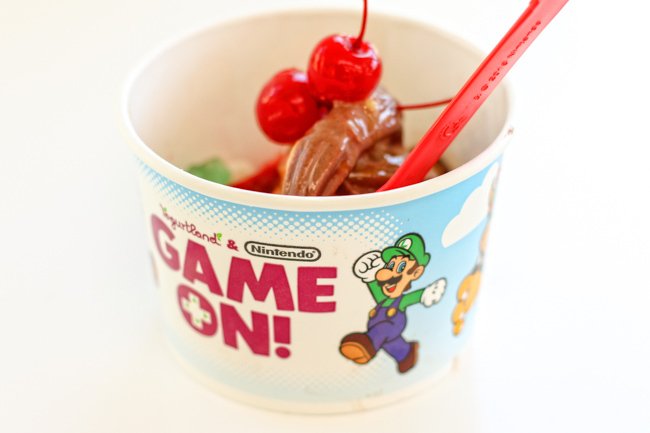 Plus, for this summer only, they're teaming up with Nintendo to release some very special Mario-inspired flavors. On my recent trip, I had the pleasure of enjoying Mario's Chocolate Gelato with "real chocolate, rich cocoa, and a hint of vanilla for a creamy blend of chocolatey goodness" and Donkey Kong Banana Cream made with "real bananas with rich vanilla for a velvety sweetness that will leave you in a banana bonanza"
Make sure to check out even more Nintendo inspired flavors now through September 8!